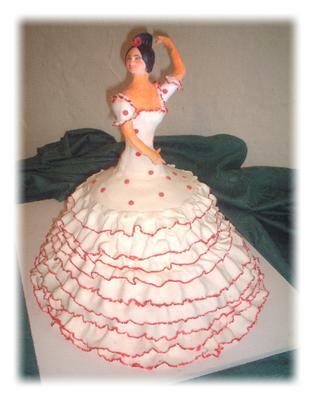 I made this cake as part of the village Feria where I live in Granada, Spain. The head and torso were hand sculpted totally from gum paste around a central dowel which was secured to the base board. The cakes were cut in half and fitted round the central dowel. The cake is constructed from 1 x 16" + 1 x 12" + 1 x 8" round pound cakes. They were split into 3 sections each and filled with alternate layers of Strawberry flavored butter cream and fresh sliced strawberries and Fresh whipped Chantilly cream. I then stacked and sculpted them to the dress shape, crumb coated the whole thing and well chilled. I then covered the whole dress part in rolled fondant, smoothed and left to settle for about 4 hours before starting the frills. The dress was built up from the bottom with strips of rolled fondant and I just used water to adhere them, I did not frill them, just pleated them as I stuck them onto the cake. Finally I dressed the bodice, cutting out a mini dress pattern in fondant and finishing the sleeves and neck line with ruffles. I finished off by hand painting the red edge to all the edges. She stands 17" tall and took me about 80 hours to complete. May I ask you to place some ads of my site CostumeLook Costume Ideas on you blog? THAT CAKE IS SO BEAUTIFUL AND IT SOUNDS SO DELICIOUS, IT JUST MADE ME SO HUNGRY, IT SOUNDS LIKE YOU PUT A LOT OF WORK IN THIS CAKE. KEEP UP THE GREAT WORK! !